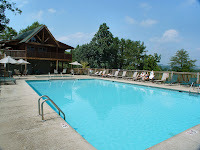 This Summer the perfect place to spend your family vacation or weekend getaway is Oak Haven Resort & Spa! Enjoy our on-site day spa, outdoor pool, playground, basketball court, gameroom, nature trails, & much more! Let us help you find the ideal cabin, best attractions, and relaxing spa treatments! Call us at 800-652-2611 or visit us at http://www.oakhavenresort.com/ for information. Our friendly staff is looking forward to hearing from you soon!